We oversee logistics associated with major exhibition projects. These projects often travel to museums worldwide and also appear in alternative exhibition spaces. Below are selections from our portfolio. Client: Chronicle of the People, Inc.
An exhibition, sponsored by Sanrio, Inc., celebrating the 40th anniversary of "Hello Kitty". Design, fabrication, and installation of custom cold-light low-UV LED illuminated vitrines for display of volumes associated with hand -drawn nineteenth century map of Great Britain’s geomorphology. One of a number of exhibitions we have been involved with at this important cultural space. Curator Jennifer A. Watts explored how photography and other media were used to describe, to explain, and perhaps to come to terms with the trauma that was the Civil War. The exhibition focused on key episodes to highlight larger cultural themes. An exhibition, announcing the opening of this beautiful performing arts center, included a collection of 130 theatrical costumes and design illustrations created by Italy’s haute couturiers for opera, dance, and theater. The exhibition explored the contributions of these designers through their inspired creation of costumes for the stage and examined the unique imaginations of these renowned creators of fashion. Services: project and publicity oversight; publication of exhibition catalogue. Herb Alpert's sculpture installation, exhibited at Ace Gallery, Beverly Hills, represented the culmination of over a decade of work in the sculpting studio. Since 1970 Alpert has presented his sculpture and paintings in over twenty solo and group exhibitions worldwide, and in 2010 he was the subject of a BBC documentary. Services: logistics management, packing, crating, shipping services. A comprehensive exhibition celebrating the work of Charles and Henry Greene that featured more than 140 works designed by the Greene brothers and covered the breadth and depth of their careers, including work with stained glass, metal, textiles, architectural drawings, archival photographs, and dazzling woodcarving and decorative inlay. This exhibition examined the synergistic relationship between Los Angeles and photographic art from the mid-nineteenth century to the present, and explored the correlation between photographic representation and the city that most of the world identifies with the film and television industry. The exhibition was curated by Jennifer A. Watts, curator of photographs at the Huntington Library, and Claudia Bohn-Spector, an independent scholar. The exhibit included over 400 items salvaged from the seabed wreck interspersed with models of the vessel, a ten-meter-long seabed wreck, a 1/3 scale side of the hull of the ship and a full scale deck scene with simulated seascape and night sky. The exhibition received attendance in excess of 650,000 visitors in its four month showing in Memphis and 550,000 at its second venue in St. Petersburg, Florida. The Getty Conservation Institute worked for many years in Tanzania, on the conservation of the Laetoli trackway discovered by anthropologists Louis and Mary Leakey. The trackway, world renowned for the oldest impressions of bipedal hominids and dated at over three million years B.C., is located along a geological ridge forty miles from the Olduvai Gorge. The Center was founded in the late 1970s and managed by the Tanzanian Government's Department of Cultural Antiquities. This exhibition highlights nearly a hundred Jamaican artists and musical developments and tells the story of those who took Reggae from its small island roots and transformed it into a global culture. 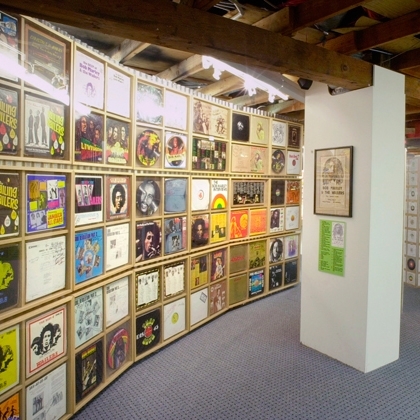 Thousands of artifacts were selected from the internationally renowned collection of Reggae authority Roger Steffens.